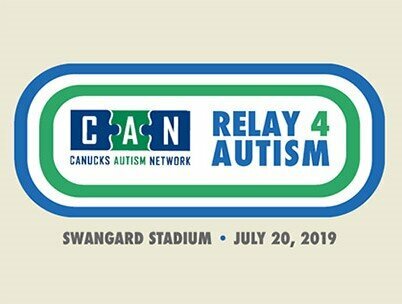 The first-ever CAN Relay 4 Autism will invite families, supporters and the general public to walk/run around the Swangard Stadium track in support of Canucks Autism Network! Taking place Saturday, July 20th from 10am-3pm, this FREE family-friendly outdoor event will also feature carnival games, bouncy castles, food trucks, music, and a vendor marketplace. Sign up as an individual or team! Set a personal or group goal to walk/run a chosen number of laps around the track and collect pledges from friends, family and co-workers to help you reach your fundraising goal. Sign up by April 30 and receive a limited edition CAN Relay 4 Autism arm band or headband! Be one of the first 66 to raise $100 and receive a CAN water bottle! Two Canucks lower bowl tickets to a 2019-20 game & $100 gift card for CAN merchandise. Plus a CAN water bottle & $5 food voucher for each team member. Jake Virtanen signed jersey & $75 gift card for CAN merchandise. Plus a CAN water bottle & $5 food voucher for each team member. Brandon Sutter signed stick & $50 gift card for CAN merchandise. Plus a CAN water bottle & $5 food voucher for each team member. This entry was posted on July 20, 2019 by Events Manager.